Welcome to Luau Luxury Vacation Rental Properties! This two- tower, high rise complex offers guests the comfortable stay that they have been looking for when it comes to a vacation. The suites in this resort come with fully-equipped kitchenettes in the studio units and then a bigger and more ideal kitchen setting in the other units. They also come with cable television and high-speed wireless internet. Outside of the rooms, guests will find that this complex supplies them with a fitness center, saltwater pool, a kiddie pool and hot tub. A feature to the pool that all guests love is the poolside tiki bar that gives guests a variety of snacks and frozen drinks whenever they may like. Make the short walk to the sugary white sands of Miramar Beach and enjoy the sun, waves and all of the activities that it has to offer. Make sure to step out of your comfort zone and rent a jet ski for a few hours with your family, or reserve a spot to go parasailing and see what the beautiful blue waters of The Gulf has to offer that you can't see just from sitting on the beach. 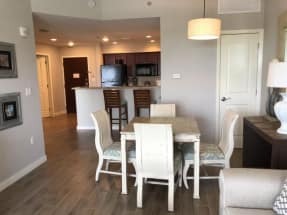 Scroll down now to view our selection of Luau Sandestin FL condo rentals. Be sure to click on the 'Email Owner' button found on each listing to send the property owner a message directly, they will get back to you and gladly assist you in the booking process. ECBYO does not charge any service fees when you book with us!